I have seen the future of typesetting. It happens in your browser, it doesn’t need Flash, and it looks and feels just as nice as Adobe InDesign. It’s also free, at least for now. Lucidpress isn’t even out of Beta yet, but it is already one of the slickest and most surprising Web apps I’ve seen in recent memory. Surprising, as in the multiple times I found myself thinking, “I didn’t know you can do that in a browser” while working on my mock document. 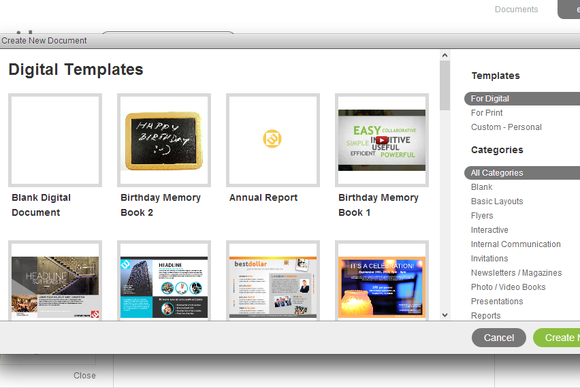 Lucidpress makes it easy to get started with premade templates. Just like InDesign, Lucidpress presents you with a document containing multiple pages onto which you can lay out your content. You can drag and drop textboxes and images around, recrop images, pick from hundreds of included fonts or upload your own, and more. 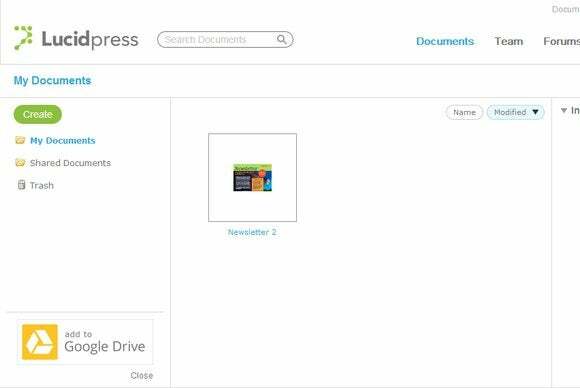 But Lucidpress goes further, and lets you create documents that are meant to be viewed online, or using a tablet. If you wish, you can include YouTube videos and scrolling areas in your document—ending up with an interesting hybrid that looks as polished as a traditional brochure while seamlessly melding interactivity. It feels sort of like a Harry Potter newspaper. 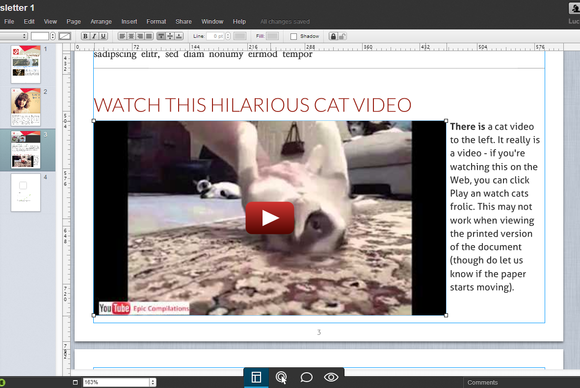 Want a YouTube video in your document? No problem. Reading about it, it’s all too easy to mistake Lucidpress for another website-making tool. That is not the case: You don’t make a website, but a PDF, with all the trimmings of professionally produced documents. You get layers, advanced text controls, textbox reflowing, page templates, and just about anything else you would expect from a full-fledged desktop publishing application used for creating magazines, brochures, and other commercial items. 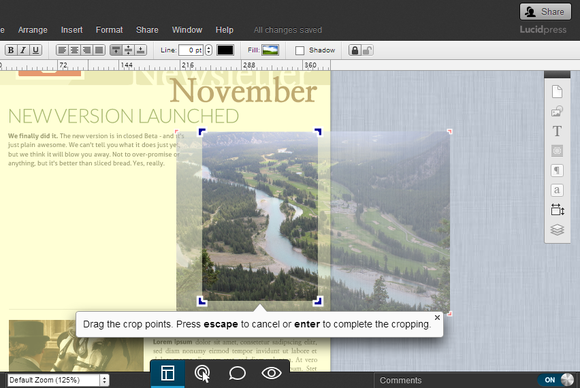 In use, Lucidpress feels like a solid, commercial-quality desktop publishing application. This sort of thinking, which lets you enjoy the benefits of traditional desktop publishing while extending it with modern features, is used across Lucidpress. 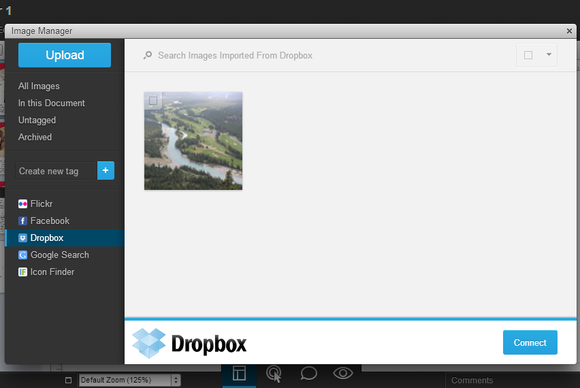 For example, you can easily import images from Dropbox using the service’s sophisticated Chooser interface. I didn’t even have to sign into Dropbox or grant Lucidpress access to my account—Dropbox’s Chooser did all of the work, letting me browse my Dropbox, preview images, and pick the one I wanted. Lucidpress supports several image sources other than Dropbox, including Flickr and Facebook. 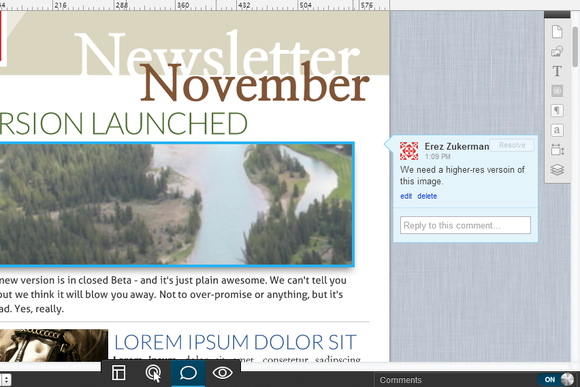 Running in a recent stable version of Chrome, Lucidpress feels rock-solid. Since it does run in the browser, however, it is at the mercy of whatever browser extensions you happen to have installed. One Chrome extension caused an issue with resizing images in Lucidpress: Whenever I dragged an image bounding box, the document would scroll. Starting Chrome in Incognito mode, which doesn’t load any extensions, solved the issue for me. Another key advantage of working in the cloud is collaboration. Lucidpress lets a number of people view and work with a single document at the same time, and includes powerful commenting features. Each document also has its own chat window, making remote collaboration easy. Comments make it possible to discuss specific parts in the document. Lucidpress is a pleasant surprise. Rarely are services in Beta so stable and so feature rich, and yet it overdelivers on all fronts. My only hope is that its pricing structure, yet to be announced, keeps it affordable enough so that everyone can make use of it. If that happens, Adobe has reason for concern, at least when it comes to desktop publishing. Lucidpress shows where desktop publishing is headed in the era of iPads and Web apps.